[0:01] <frite> How do you start a SSH session? [0:08] <frite> i meant how do i connect from the PC? [0:12] <RebelCoder> frite: what OS are you on ? And are you trying to connect to your Pi ? [0:12] <RebelCoder> No google needed. [0:13] <RebelCoder> Pi and PC on the same network.. right ? [0:13] <RebelCoder> Do you know the IP of your Pi ? [0:13] <RebelCoder> ok. is your Pi on a second monitor - can you see what is on it ? [0:14] <frite> infconfig only shows my laptop ip doesnt it? [0:15] <RebelCoder> If you connect your Pi directly to Your PC, what cable are you using ? if PATCH - then it will not work. You need Cross Cable to do PC - Pi. [0:15] <RebelCoder> Can you connect the Pi to your router, instead of your PC directly ? [0:18] <RebelCoder> then it will not work. [0:18] <RebelCoder> If he is using cable, used to connect PC to a Router, then it is a Patch Cable. And it will not work for PC Direct To Device. [0:20] <gordonDrogon> not in 2015. [0:20] <gordonDrogon> unless its a very very old PC. [0:21] <RebelCoder> gordonDrogon: what does the cable have to do with the year ? [0:21] <gordonDrogon> The Pi's NIC is auto-sense, so no x-cable ever needed there. [0:21] <gordonDrogon> x-cables are 1900's technology. [0:21] <gordonDrogon> then you can connect them back to back without an x-cable. [0:22] <RebelCoder> Tried a while ago... Now I am on wireless for all devices..
[0:22] <bsuh> Karlton: how do i copy my root to a USB card? [0:22] <frite> the pi uses dhcp? [0:23] <frite> cant you list a device if it is directly connected? [0:23] <RebelCoder> don;t think so. [0:23] <RebelCoder> frite: can you connect to a rounter instead ? [0:24] <frite> how can i get the ip after that? [0:24] <RebelCoder> if it is not connected to a screen and you can;'t see the output..
[0:25] <RebelCoder> Android app "Network Scan"
[0:26] <Karlton> can't you do that with nmap? [0:27] <RebelCoder> SpeedEvil: is that your cat ? [0:28] <RebelCoder> frite: you can connect it there now and we will help to SSH in to it. [0:29] <RebelCoder> and it will be on your desk, WiFi connected at all times. [0:30] <RebelCoder> Karlton: moving what ? [0:30] <RebelCoder> why to move it ? [0:32] <RebelCoder> I think Pi on WiFi is the best option. [0:37] <RebelCoder> so it works ? [0:37] <RebelCoder> frite: Works ? [0:39] <RebelCoder> frite: ..soo.... does it work ? [0:39] <frite> yes now i found the pw, thanks! [0:39] <frite> is it easy to set up the USB wifi? [0:39] <frite> just plug it in and then...? [0:42] <RebelCoder> Ok. Keep hacking. I have to work here too. Let me know if you need more help later on. [0:44] <frite> RebelCoder, is the usb enpugh power? [0:45] <RebelCoder> Smasher: what is the make of Your USB ? [0:45] <RebelCoder> who makes it ? what does it say on the adapter ? [0:45] <RebelCoder> ALFA.... exactly the case of unknown brand stuff. [0:47] <RebelCoder> Karlton: Exactly right. [0:49] <RebelCoder> Smasher: not change. get the proper, working and up to date hardware. [0:49] <RebelCoder> then everything works. [0:50] <RebelCoder> Where did you get it ? [0:51] <RebelCoder> but you don;t have strange Accent ! [0:51] <RebelCoder> You are not German ! [0:52] <RebelCoder> Ok. I have to work now. [0:57] <frite> in the interfaces file is supposed to have "" around the wpa ssid and pw? [1:01] <frite> hmm, is it the WPS PIN that is the password for your SSID? or is it the Wireless Key? [1:02] <frite> yes so i have the right pw, should it be surrounded by ""
[1:03] <frite> in the interfaces file? [1:03] <frite> yes but wpa-ssid MyHomeWifi or wpa-ssid "MyHomeWifi" ? [1:06] <RebelCoder> good. reboot and disconnect the cable. [1:06] <frite> so not working? [1:06] <frite> not enopugh power from usb perhaps? [1:06] <RebelCoder> so WiFi doungle is not detected ? 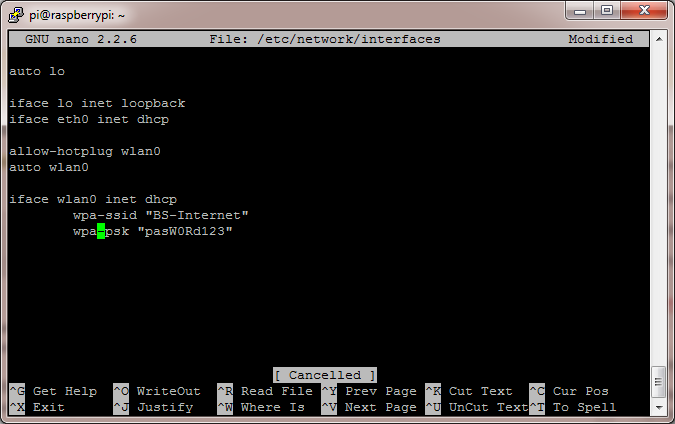 [1:08] <ali1234> you need to do "ifconfig -a" to see adapters which aren't "up"
[1:15] <frite> can i transfer it via ssh? [1:17] <ali1234> this firmware is supposed to be in the firmware package now? [1:18] <puff> Good evening. Can somebody point me at the SIP standard for controlling LEDs? I'm having trouble googling it due to false positives on session initiation protocol SIP. [1:19] <puff> Or did I get confused, is it called SIP or isit really SPI? [1:21] <frite> ali1234 where can i find it? [1:21] <puff> ali1234: I could swear I saw a reference to SIP, I remember thinking "wait, isn't that for VOIP?" [1:21] <ali1234> puff: what are you actually trying to do? [1:22] <puff> What protocol does ws2801 implement? [1:22] <puff> ali1234: Already did it :-). [1:23] <puff> ali1234: thanks. I must have been mistaken (from too much caffeine :-). [1:25] <ali1234> frite: what version is installed? [1:28] <frite> how do i see that? [1:29] <sentriz> Hi, I'm running OSMC on an RPi2 with media stored on an external HDD. Would it be a good or bad idea crontab the mounting and unmounting of it while I'm in school? I would like to prolong the life of the disk as much as possible. [1:33] <frite> raspbian jessie means getting a new OS...? [1:34] <frite> anyway, ty have to go to bed now but will continue next week. [1:35] <sentriz> ali1234: ah okay. How would I go about changing the spin down time? I'm on mobile. [1:37] <Smasher> do somebody develop under c for rpi? [1:37] <Smasher> or even asm? [1:38] <Smasher> do i need certain gcc flags to use it? [1:38] <Smasher> or some special intrinsic? [1:38] <ali1234> Smasher: what's the name of the extension? [1:38] <Smasher> or do i doomed to code that part in asm? [1:52] <semininja> Have there been any other reports of problems with images not being written properly? [1:52] <ali1234> are you sure they are genuine? [2:45] <poolson> is this a normal thing? i assume not. whats some good approaches to narrowing it down ? [2:46] <JK-47> how many connections do you have open in time_wait? [2:47] <ali1234> JakeSays: is that the stall current? [2:48] <CoJaBo> They also backfeed plenty of noise into the PSU, which will make things "exciting"
[2:49] <JakeSays> well, i'm under some time constraints, so for now i'll just stick to the two supplies. down the road i'll refactor the power system. [2:54] <JakeSays> what were you using for controllers? [5:41] <insomniPI> is the pi model 2 a 32b or 64b cpu? [6:28] <insomniPI> is it quicker than raspbian or something? [6:33] <insomniPI> I guess it is pretty quick to reinstall. [6:35] <insomniPI> I'll get another card & install it on there. [6:42] <insomniPI> if I have more than one of them that is. [6:42] <insomniPI> I gave the other one to my boyfriend & he's playing with it. [6:42] <insomniPI> just not on the same level yet. [6:50] <insomniPI> what are you using to do it? [7:07] <kookie> both are 4 port. [7:10] <insomniPI> "We had .not. considered that, Dude." [7:11] <insomniPI> yah, i wasn't thinking. [8:46] <hstl> Guys, sorry for stupid question, i am in a hurry. http://onpad.ru/shop/cubie/raspberrypi/Accessories/1791.html - this thing gives video from Raspberry Pi or takes video from composite camera? [8:49] <hstl> ShorTie, thank you! Are you sure? [8:51] <hstl> yeah, figured it. Input is just for Raspberry Pi camera. Tahnk you! [10:12] <iobug> can i lower the hdmi resolution? [10:20] <iobug> how much is max overclock possible for pi? I see 1 Gh/s but may be is dangerous? [10:24] <ankr> "RPi 2 Model B" <<< That's the bleeding edge, right? [10:24] <ankr> Last time I looking into raspberri pis there were only model A and B, so many now. [10:55] <Mafdet> I know, this might be the wrong channel for this question - but the banana pi channel seems pretty silent. But any advice would be highly appreciated. [10:55] <Mafdet> So here's the question: Can I use the Rasperry Pi OS (raspiab wheezy) on the Banana Pi, and therefore use Piracast on it? [10:56] <Mafdet> If that's possible, why should I choose a Raspberry Pi (like the model B+) over a Banana Pi? [10:57] <Armand> Apparently it will run Raspbian. [11:12] <Mafdet> Yeah, I think the smaller power-consumption is surely a plus for the Raspberry Pi - especially for scenarios where it's always running, like some home-automation project or the like. [11:13] <Mafdet> I'd simply get both if I weren't on a tight budget. [11:31] <Mafdet> shauno, and yeah, the support obviously is an even greater point. For example 'rPlay' is/was first developed for the Raspberry, even though the Banana Pi is more powerful. [11:32] <Mafdet> I may be wrong, but the Raspberry Pi also seems to have better video acceleration support. [11:36] <PaowZ_> hi there ! Jessie img exceeds 4Gb once expanded.. Do we really need to get a sdcard over 4Gb of space ? [11:38] <PaowZ_> I mean, it implies sdcard has to be 8Gb, is this the common size for a sdcard ? [11:40] <PaowZ_> 1. WHAT SIZE SD CARD DO I NEED? [11:40] <PaowZ_> sorry for bothering..
[11:54] <day> Smasher: or that yes. [12:02] <edoderoo> is there a recommended OS for programming Python on the pi? [13:09] <pksato> After read some text, and watch videos, about voltage level shift, all telling to avoid voltage divider, I decide to simulate some circuits. [13:10] <gordonDrogon> pksato, avoid voltage dividers? 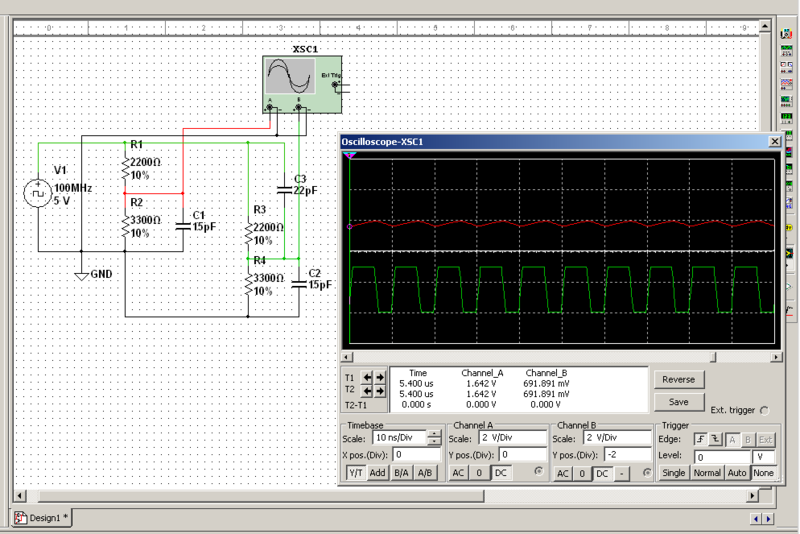 [13:11] <pksato> Two voltage divider, using low values resistors (10mA), and high values (1mA) http://i.imgur.com/L302HGH.jpg. Capacitor C1 and C2 are a estimated input capacitace. [13:12] <pksato> gordonDrogon: yes, on some text/video not recomend voltage divider as level shifter. [13:13] <gordonDrogon> yes - I know from experience that at higher frequencies simple dividers start to to stop working. nice demonstration there though. [13:14] <pksato> most text not mention input capacitance. [13:15] <pksato> 10MHz on these similations. [13:15] <gordonDrogon> in Pi land most of the time you get away with it as not dealing with very high frequencies. [13:20] <pksato> 1ns is rise/fall time of input signal. [13:29] <pksato> IMHO, 10mA voltage divider without compensation capacitor is acceptable above to 20MHz, up to 100MHz if delay is not critical. [14:14] <edoderoo> Ubuntu-Mate first run ... I'm excited! [17:44] <Hasselsaurus> is raspi-config available on ubuntu for Pi? If not, is there a reason someone hasn't ported it? [18:16] <Moonsilence> Hey, I can no longer quit a python process (interactive nor script mode) with ctrl-c like I was used to. It just adds ^C to whatever is beeing outputted by python. Dunno what I did. [18:16] <Moonsilence> ctrl-c still works for all other commandline programs. [18:21] <Moonsilence> Why does every python process run as a job now? [18:23] <Moonsilence> nyt, with Ctrl-Z I was sending them to backgroud. [18:23] <Moonsilence> I wand to ctrl-c them. [18:24] <Moonsilence> What could have caused this, that I can no longer ctrl-c python? [18:28] <nyt> what happens when you hit ctrl-c just running python3? [18:28] <nyt> do you get 'keyboardinterrupt' displayed? [18:29] <Moonsilence> Yes, but next the python interactive command promt (>>>) reappears. [18:34] <Moonsilence> nyt, thanks for the help! It seems to be ok now. [18:36] <CharlesN> hi I'm running netbsd on a raspberry pi2 is it possible to migrate the root to a usb drive ? [18:48] <gordonDrogon> the principle will be the same - copy the entire SD card to the USB drive, then do whatever you need to do to tell BSD to mount root from the USB stick. [19:11] <Tenkawa> Anything new in rpi land? [19:14] <exonormal> oh? what are those? [19:18] <exonormal> have you looked at a ADALM1000 board? [19:21] <exonormal> I use Unos, Quickstarts, and homework boards..
[19:29] <Tenkawa> anything on the console? [19:31] <at0m> brethil: does your pi use dhcp for eth0? maybe the router gives it another IP? [19:32] <Tenkawa> at0m: would that hard lock the machine though? [19:32] <at0m> brethil: do you have physical keyb/mouse on the pi, or do you ssh in? [19:33] <Tenkawa> does it stop taking pings? [19:37] <at0m> so you got 3 dhcpd's? time capsule, airport express and your router? [19:38] <at0m> either disable all but one, or set static IP on the pi. no IP thing can make the pi crash. [19:39] <brethil> I'll try experimenting, though, would hard-unplugging the pi result in a "crash" entry in the "last" command? [19:41] <at0m> brethil: i'd try static ip, and i imagine your pi will remain connected to your ssh session. [20:20] <_Trullo> forgot my password to the raspberry pi, reinstall? [20:23] <_Trullo> ok, gonna run xbmc on it, which is the recommended image for that? [20:23] <exonormal> that I do not know, sorry..
[20:24] <exonormal> if you can, try what words you used as the pw before doing the reinstall..
[20:43] <lindenk> hey, does anyone know of a linux board with a smaller form factor than the rpi? [20:45] <exonormal> the Gallio Intel board? [20:47] <IT_Sean> lindenk: Pi computer module? [20:50] <IT_Sean> Yea... I know... I was suggesting it, in reply to your asking for something with a smaller footprint. [21:02] <TheLostAdmin> if you are willing to stray away from the Arm family of processors, intel has a few options that look like USB thumb drives with an HDMI header on one end. [21:10] <TheLostAdmin> I haven't looked in much detail. I don't need anything that small now that I have a Raspberry Pi. I do know those stick computers got a major upgrade due to competition from the Raspberry Pi and things like the chromebook on a usb stick things. [21:10] <TheLostAdmin> I took a quick look at Gumstix and they seam to have expanded their options as well. [21:10] <IT_Sean> lindenk: HAVE you looked at teh Pi Compute Module? [21:26] <lord4163> what happened to pidora and arch for the raspberry pi? It isn't on the download page anymore? [21:29] <exonormal> lord4163: try github? [21:43] <lord4163> so it is not supported anymore or what happened to it? [21:46] <myself> Well this is lovely. I'm dealing with random data in my shift register on boot, and I figured there might've been noise happening on the SPI pins or something, but no, I just looked at it with a logic analyzer and there's only a single negative-going transition on CE2#, everything else is quiet the whole time. [21:47] <myself> Soooo, I think I need a reset circuit. [21:48] <myself> Can I drive external circuits from the RUN signal on P6? [22:03] <frite> ERROR: The certificate of `dl.dropboxusercontent.com' is not trusted. [22:07] <pksato> frite: wrong system time? [22:16] <frite> is that the problem you mean? [22:28] <frite> how do i reboot the raspberry? [22:35] <edoderoo> might depend on the OS you run? [22:40] <frite> how do i set the date to today? [22:47] <gordonDrogon> or one local to you, if possible - e.g. uk.pool.ntp.org for me. [22:48] <Moonsilence> Why can't I use executable files in my ~/bin as commands in my own cronjobs? It only works on the commandline. [22:51] <Moonsilence> But doesn't cron run all jobs as my user, and therefore is subject to my env vars? [22:51] <gordonDrogon> it runs as your user, but doesn't run the .bashrc/.cshrc files. [23:02] <frite> so when I was connected via ethernet i could surf the internet with my raspberry but now i use wlan and i cannot, what could be the problem? [23:12] <frite> What do I change to get a conenction to internet and not just a local connection for my raspberry? [23:16] <gordonDrogon> probably your default route.